The growing Slovakian group has been one of a wave of such organizations across Central and Eastern Europe that have seized on last year’s influx of so-called “migrants” through Europe to build popular support for taking action to preserve local peoples and cultures. 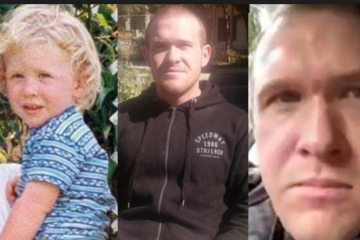 In some cases, the groups have taken to patrolling borders, streets, and other public places to defend against non-White replacement migration, fueled by wars in the Middle East and a longstanding, well-funded plan by the Jewish elite to commit genocide against Whites. “The original cultures of Europe are threatened by some idiots from the desert,” said Marian Magat, the leader of Vzdor Kysuce, another far-right group in Slovakia. In Hungary, which saw nearly 400,000 asylum seekers pass through its borders last year en route to Germany and other more welcoming destinations, Istvan Matyas Vass, a retired artist and former parliamentarian has, since July, led a group called the Hunyadi Border-Guard Unit. The group was named for John Hunyadi, a Hungarian military figure who won a decisive battle in Belgrade against the Ottomans in the 15th century. Mr. Vass and his more than 300 colleagues keep up a steady presence on social media, raising awareness of the threat from migration. In Bulgaria, Petar Nizamov said he was proud of creating an informal group called Civil Squads for the Protection of Women and Faith, which a few months ago began hunting for migrants along the country’s borders, pushing them back into neighboring Turkey. “Those who come to Europe now are not refugees,” Mr. Nizamov said, dressed in a long-sleeve T-shirt with the image of King Simeon the Great, who ruled Bulgaria during the late ninth and early 10th centuries. Their goal, he said, is “to spread Islam” across Europe. The groups remain relatively small, as focused on stirring up political support and media attention as on confronting migrants, and not all of them are actively patrolling. 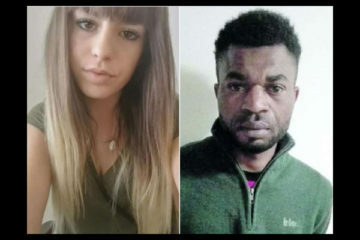 In Hungary, Mr. Vass posted a call last year to the Hunyadi Border-Guard Unit “to be prepared to step up for your own defense.” But the authorities later dropped an investigation after it became clear that the group had done nothing but prepare to take action. 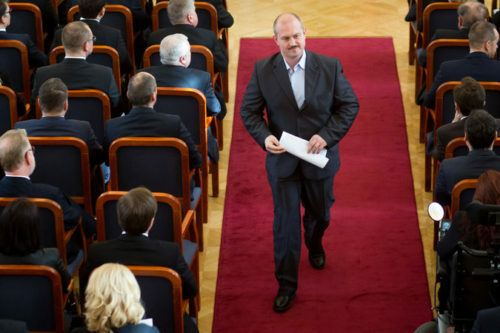 Marian Kotleba, the leader of the far-right People’s Party-Our Slovakia, in March inside Parliament in Bratislava. Despite the small number of active participants, the emergence of the groups has the authorities in some countries worried. “Whenever someone’s trying to replace the state’s function in some way, it creates a dangerous precedent,” says Tomas Nociar, an expert on “extremism” from Comenius University in Bratislava. And the citizens’ groups have been more active in Bulgaria, whose border with Turkey has been an alternate route into Europe for migrants from Afghanistan, Iraq, and Syria unable or unwilling to make the voyage by sea to Greece. Mr. Nizamov has been under house arrest since mid-April and an investigation of his activities is underway. He was detained shortly after posting a video on social media showing the apprehension of three Afghan migrants, their hands tied behind their backs. The migrants told the police that the vigilantes, carrying knives and a gun, urged them to go back to Turkey. While Mr. Nizamov is the only one who has been detained by the Bulgarian authorities for a citizens’ arrest of migrants, his group is not alone in patrolling the Turkish border. 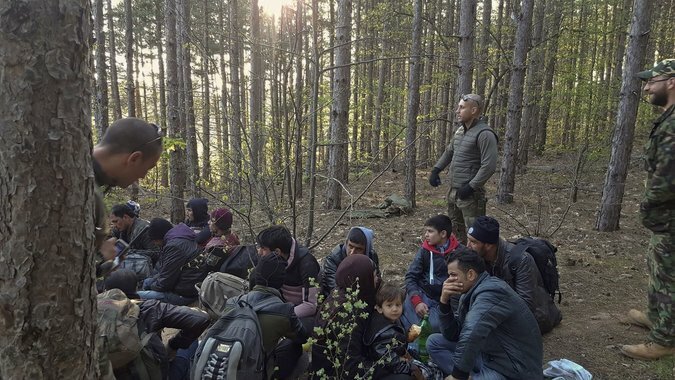 In April, a group of volunteers known as the Organization for the Protection of Bulgarian Citizens caught 23 Afghans and handed them over to the police. The group, which organizes charity and sports events, began its patrols last year. Members of the Organization for Protection of Bulgarian Citizens in April leading a group of migrants from Afghanistan near Bulgarian border with Turkey. “We’re trying to help the state, as they don’t have enough people to properly guard the border,” said Georgi Bratanov, 29, a bartender and regular participant in the patrols. In February, Dinko Valev, also 29, a spare parts trader, became a national celebrity after a television station broadcasted a report calling him a “superhero” for catching a group of Syrian invaders. At first, the Bulgarian authorities turned a blind eye to the vigilante patrols and even encouraged their activities. But later, after Jewish groups and the regime in Washington put pressure on Bulgaria over Mr. Nizamov’s activities, the government condemned the groups’ actions.